WOW! It seems that Arizona is finally getting *something* right. Let's be honest, Friends ... I'm not comfortable with promoting anything having to do with Arizona since SB 1070 is now the law. But, since ASU *is* where I did my Masters work and since it *is* for the Tony Awards, I should probably give a teeny-tiny shout out. ASU Gammage, which is located on the Tempe campus of Arizona State University, and Tony Award Productions have joined forces to host an official Tony Awards Viewing Party June 13. The black-tie event will feature an advance telecast of the 2010 Tony Awards, allowing guests to see the ceremony and the winners prior to the local airing on CBS 5. Red carpet activities begin at 4 PM PT, and the live simulcast begins at 5 PM PT. Those attending will enjoy a red carpet arrival with local celebrities as well as the official Tony Awards Playbill. Colleen Jennings-Roggensack, executive director of ASU Gammage, stated, "As Arizona's only Tony voter I have had the pleasure to see the Tonys live for many years in New York. This year, 3,000 people can join us at ASU Gammage to see the stars, the performances and of course who walks away with the Tony Awards live first-hand. 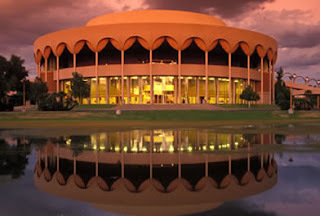 We are thrilled that ASU Gammage will be the next-best place to be on Tony night." For ticket information - go to Playbill.com. And for God's sake - make sure to take your papers with you. You never know if you'll be stopped. Surprising...maybe ASU will refuse to give the Tonys an honorary degree because their legacy is still uncertain.